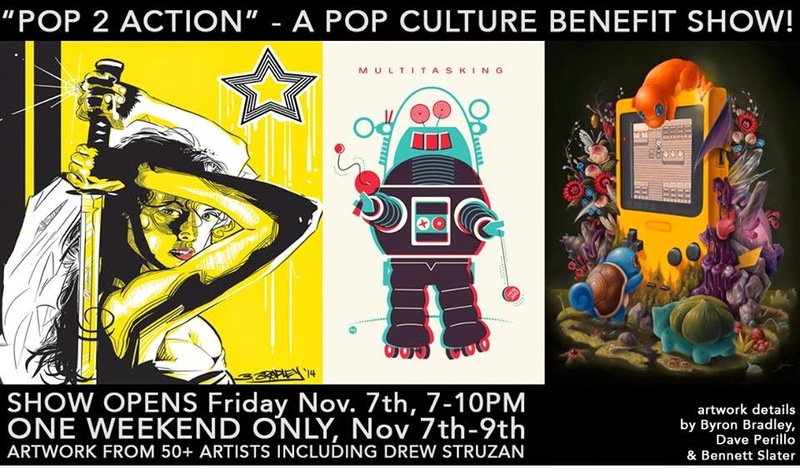 Last night I had the pleasure of attending the opening night of Pop 2 Action, a collection of original artwork inspired by pop culture and mass media influences. The event took place at the Hero Complex Gallery in Los Angeles and was organized by Dana Ashmore (Mob City) and Laura Bousman (The Devil’s Carnival). These amazing ladies are the founders of Gratitude Collaborative, an organization with the mission to generate art that serves a purpose. The goal of this weekend’s exhibit is to raise money to teach art classes to kids, purchase school supplies, feed the hungry, sponsor after-school programs, and support young playwrights. I found out about the event on Twitter through Darren Lynn Bousman. The director of Saw II, Saw III, and Saw IV is a fellow alumnus from my alma mater, so I figured it would be great to support his wife and this great cause. There were several pieces that really struck my attention. One in particular by artist Tou Vue. His painting portrays a couple laying on the ground with their backs to each other and holding a cell phone. The artist used this as a way to express how technology and social media is a double-edged sword; it brings us together but at the same time it separates us. There was art inspired by Kill Bill, The Wizard of Oz, Pokemon, and much more, but I ended up acquiring an amazing painting of Morpheus from The Matrix. It’s basically Morpheus’s face wearing a set of 3D glasses, which represent the red and blue pill that he presents to Neo. The artwork is titled Red Pill, Blue Pill and was created by Lord Byron Bradley.